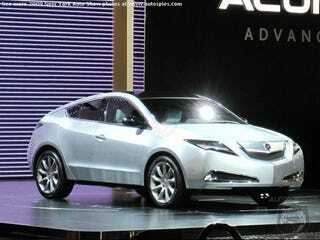 Acura ZDX Concept: Sneaky First Look! The Acura ZDX crossover concept has been spotted on the New York Auto Show floor by AutoSpies, revealing a four-door sports coupe with much less machismo than previously hinted at. The sneaky spies from Auto Spies snuck into the show early and snagged this photo of a ZDX without its cover. For a vehicle supposed to fill in as a type of BMW X6 halo vehicle it sure looks like a car. According to Acura, the production version "will bring a new level of prestige to the Acura lineup when it arrives at dealerships this fall and offer the latest advancements in performance, technology and safety"
If by "new level of prestige" you mean "an angular Venza" then SUCCESS! Actually, we're happy to see the big buck-tooth grille is getting a little less bucky-toothed. However, we're now not so sure we're liking the whole Pontiac G6-look the ZDX is getting with those lower faux air intakes.